High efficiency filter helps remove airborne particles and allergens from indoor air. Carbon filtration reduces unpleasant odors up to 44%. Dual-position, slim design is perfect for table or desktop use. Handy filter change indicator plus durable three-speed motor. Air Cleaner Machine Type: HEPA; CADR: 70; Maximum Room Size (Square Footage): 110 sq ft; Maximum Room Size: 10 ft x 11 ft.
360&deg; of Purification A unique purification method promotes 360 degrees of clean air delivery, including areas low to the ground where infants and toddlers can reap the rewards. Boost Your Air Delivery The Clean Booster delivers clean air farther (up to 24 feet) and ensures more even distribution. A Powerful Filtration System for a Thorough Clean Our unique multi-filter system captures 6 different types of particles to deliver purer, cleaner air. Know the Air Quality, Right Now The intelligent LED indicator system atop the LG PuriCare&trade; 360&deg; Air Purifier changes from red to orange to yellow to green as the indoor air quality improves, a visual indication of its effective performance. Think of the Possibilities Why wait to enjoy the comfort of cleaner, fresher air at home when you can adjust key features of your LG PuriCare&trade; 360&deg; Air Purifier from anywhere, at any time? 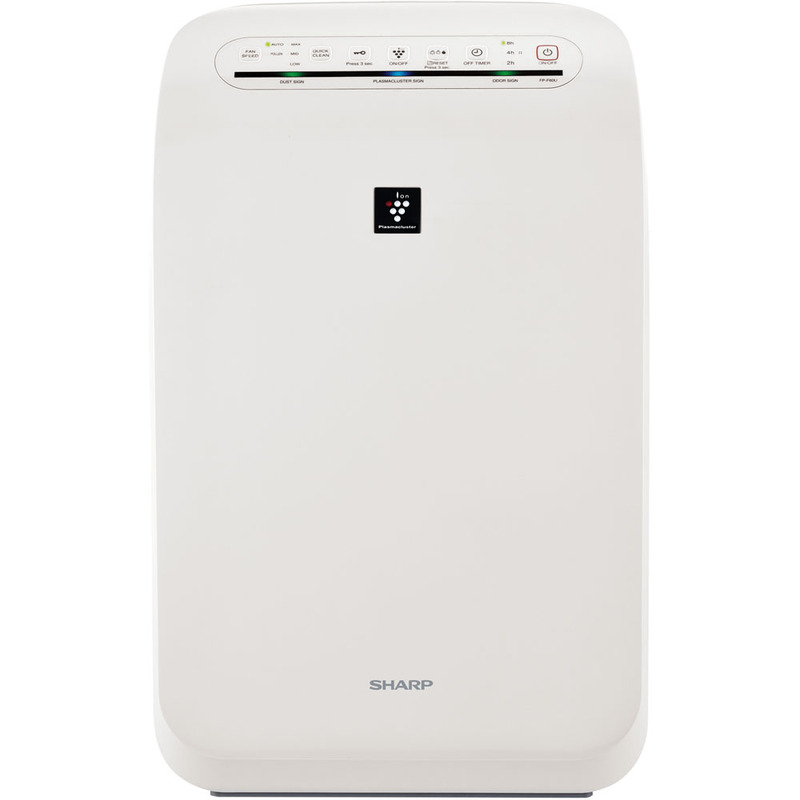 The Sharp Plasmacluster Ion Air Purifier with True HEPA Filtration effectively reduces pollen, dust, pet dander, smoke, germs, bacteria, viruses, odors, mold, and fungus in your living space up to 210 square feet. 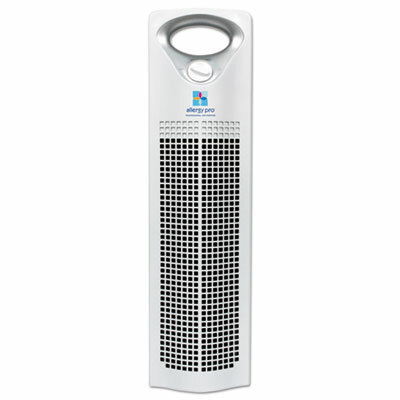 It has a back panel micro-mesh pre-filter and an integrated HEPA plus deodorization filter, which captures 99.97% of particles as small as 0.3 microns from the air that passes through it. Patented Plasmacluster Ion Technology disperses positively and negatively charged ions throughout the room to safely break down microorganisms and odors (even those trapped in fabric, carpeting, and drapery!). This is the ideal solution for allergy sufferers, asthmatics, pet owners, and smokers, and best used in a bedroom, living room, study, or exercise room. 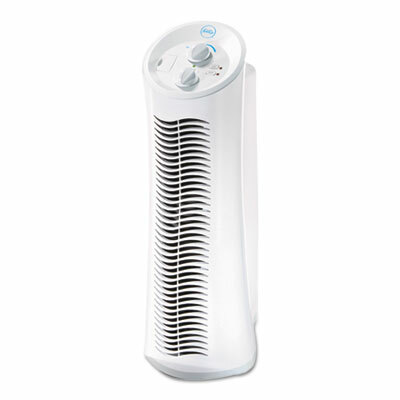 The unit has LibraryQuiet operation and is ENERGY STAR rated, so you can run the unit continuously while saving money and energy.Energy Star air purifier with odor sensor perfect for rooms up to 210 sq. ft.|CADR for Dust 153 / Smoke 133 / Pollen 155|Plasmacluster ion technology attacks impurities in the air throughout the room|Integrated 2-year True HEPA plus active carbon deodorization filter (FZ-F50HFU)|Fan speeds: Auto, Max (141 cfm), Med (112 cfm), Low (75 cfm)|Noise level (dBA): 45 high / 37 med / 29 low|Off timer (2 / 4 / 8 hours)|Child lock button|5.9 ft. power cord (UL/cUL listed)|Rated Power: 64W (high), 49W (med), 32W (low)| sharp| fp-f50uw| fpf50uw| energy| star| air| purifier| 210| sf| sq| ft| sq.| ft.| plasmacluster| ion| technology| hepa| filter| odor| sensor Package Contents: air purifier|manual|warranty This item cannot be shipped to APO/FPO addresses Sharp will no longer take back any Sharp product as a DOA.� This includes, TV, A/V Products, and any Sharp Appliances.� Please call Sharp at 1-800-BESHARP for service details.� We will not be able to accept DOA returns on this item.� Please accept our apologies. 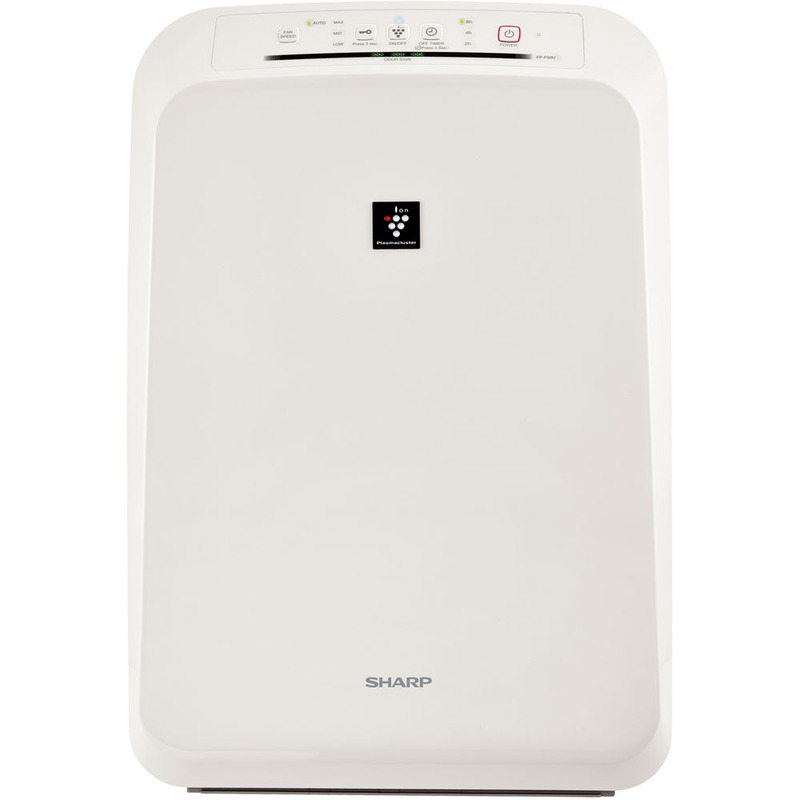 The Sharp Plasmacluster Ion Air Purifier with True HEPA Filtration effectively reduces pollen, dust, pet dander, smoke, germs, bacteria, viruses, odors, mold, and fungus in your living space up to 280 square feet. It has a three-stage filter system including a back panel micro-mesh pre-filter, deodorizing non-washable active carbon filter and long-life True HEPA filter, which captures 99.97% of particles as small as 0.3 microns from the air that passes through it. Patented Plasmacluster Ion Technology disperses positively and negatively charged ions throughout the room to safely break down microorganisms and odors (even those trapped in fabric, carpeting, and drapery!). This is the ideal solution for allergy sufferers, asthmatics, pet owners, and smokers, and is best used in a bedroom, living room, study, or exercise room. The unit has LibraryQuiet operation and is ENERGY STAR rated, so you can run the unit continuously while saving money and energy.Energy Star air purifier perfect for rooms up to 280 sq. ft.|CADR for Dust 194 / Smoke 181 / Pollen 202|Plasmacluster ion technology attacks impurities in the air throughout the room|HEPA 5-year filter traps 99.97% of particles 0.3 microns and larger (FZ-F60HFU)|Active Carbon 5-year filter removes odors and captures large particles (FZ-F60DFU)|Fan speeds: Auto, Max (202 cfm), Med (111 cfm), Low (44 cfm), Pollen|Noise level (dBA): 52.8 high / 39.4 med / 26.3 low|Quick Clean mode, Dust sensor and Odor sensor|Off timer (2 /4 / 8 hours)|Child lock button| sharp| fp-f60uw| fpf60uw| energy| star| air| purifier| 280| sf| sq| ft| sq.| ft.| plasmacluster| ion| technology| hepa| filter| quick| clean| dust| od Package Contents: air purifier|manual|warranty This item cannot be shipped to APO/FPO addresses Sharp will no longer take back any Sharp product as a DOA.� This includes, TV, A/V Products, and any Sharp Appliances.� Please call Sharp at 1-800-BESHARP for service details.� We will not be able to accept DOA returns on this item.� Please accept our apologies. 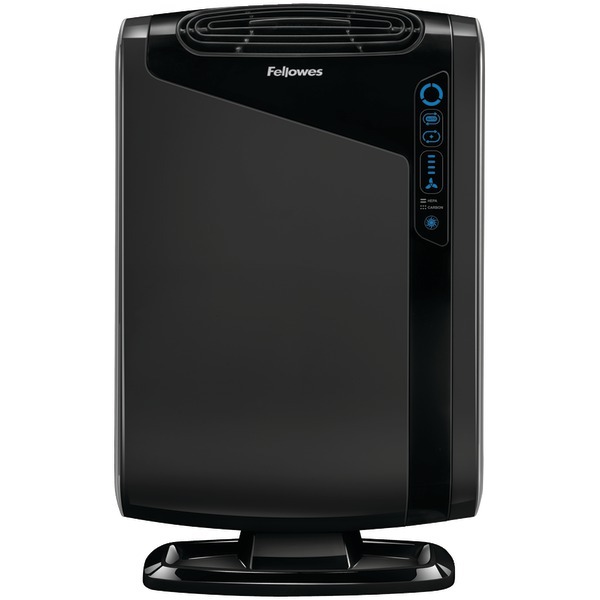 Effectively purifies air in large rooms. 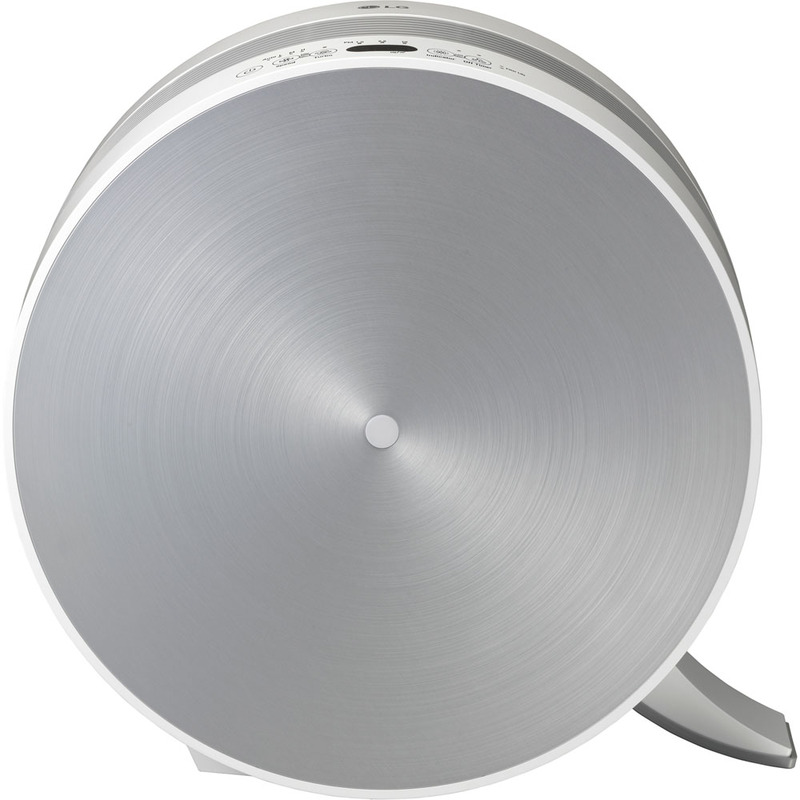 AeraSmart� sensor detects the air quality and automatically adjusts the fan speed to keep your air purified. True HEPA filter with AeraSafe� antimicrobial treatment safely removes 99.97% of airborne particles as small as 0.3 microns, including allergens such as ragweed, pollen and mold spores, as well as dust mites, viruses and germs. Extremely effective at removing influenza and cold viruses from indoor air (based on independent testing). Includes Aera+� Mode for cold/flu seasons and features ultra-quiet operation. Air Cleaner Machine Type: HEPA/Carbon; CADR: 191 (smoke); 196 (dust); 188 (pollen); Maximum Room Size (Square Footage): 290 sq ft; Maximum Room Size: 14 1/2 ft x 20 ft.
Indoor air is more polluted than outdoor air even in the suburban areas! On average a person breathes in 16,000 quarts of air each day. Indoor air can become ten times heavier with pollutants which include: dust, pollen, cigarette smoke, bacteria, viruses, and other contaminants. LakeAir™ M-22 cleaners remove particulates from the air you breathe, creating a cleaner, odorless, healthier environment. 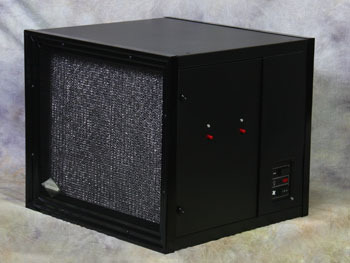 The media model M-22 air cleaner is laboratory tested and proven to remove harmful particulates from indoor air. It fits in tight places and removes up to 90% of airborne particles as small as 4 microns as well as 98% of particles 6 microns in size and larger. They are easily mounted in any position on any forced air system and can be sized to a variety of duct openings. Anyone who suffers from asthma, allergies, or even the irritation of dust, pollen or smoke will appreciate the benefits of cleaner air with the LakeAir system. LakeAir offers conversion kits to upgrade the Media air cleaner to an electronic unit with a permanent washable filter cell. The M-22 air cleaner cleans indoor air throughout your home, office, or any area where you want to breathe cleaner, healthier air. The LakeAir™ M-22's furnace filtering system effortlessly removes the circulation of dirt, dust, animal dander, lint, pollen, and other particulates from indoor air. With the M-22 you will breathe easier knowing you and your family are living in cleaner, healthier indoor air. With a decrease in dust, greasy build-up, tobacco stains and overall dirt in your household, the M-22 helps to keep your walls, draperies and furniture looking and lasting better. These units are cost effective; they require no electricity or maintenance except periodic filter replacement. Your existing furnace fan draws air into a filter pad, trapping particles as small as 1 micron. Irritating household particles are so small that ordinary furnace filters only trap about 15% of them! Small particles are measured in microns (1 micron = 1/25,400th of 1 inch). Pollutants smaller than about 10 microns cannot be seen with the naked eye. Air contains particles such as dust, pollen, mold spores, tobacco smoke, animal dander and other small irritants ranging from .01 microns to 30 microns in size. The filter has the ability to trap smaller microns and is more efficient than a standard furnace filter. LakeAir's M-22 filtering system retains airborne particles like a powerful pollution trap. As dirty air is pulled into the air cleaner from your furnace fan, particles become trapped in the Media filter. The filter is proven to be more efficient than a standard furnace filter due to the ability to trap smaller microns. Please note that the filter should be changed when it becomes noticeably dirty approximately, every 3-4 months depending on the pollutants in the air. 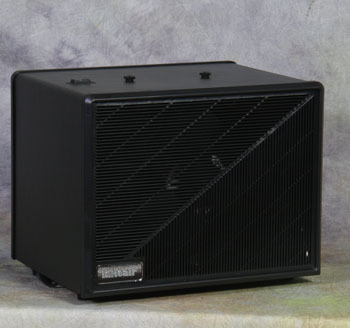 Excel Z can affordably clean the air in a room 20' x 20' 6 times an hour.The replaceable filter can last up to 6 months. providing the best in air cleaning with contemporary style and versatility. Your will notice the difference as the LakeAir Media air cleaner purifies your indoor air. Excel Z can be used anywhere you desire clean, fresh air. The Media filter removes up to 90% of airborne particles as small as 4 microns and 98% of particles 6 microns in size and larger. Anyone who suffers from the irritation of dust, pollen or smoke will appreciate the benefits of cleaner air with the LakeAir system, especially those who suffer from asthma or allergies. The LakeAir Excel Z filtering system traps up to 98% of all airborne particles (even those as small as 5 microns) for a cleaner, healthier environment. The Excel Z filter removes smoke, bacteria, pollens and dust particles from the air as small as 0.03 microns. The optional activated carbon after filter eliminates stubborn odors. LakeAir units cost just pennies to run! This unit also reduces heating and air conditioning costs by eliminating the need to exhaust contaminated air and recondition replacement air. Another advantage is when dust and grime are removed from the air, costly electronic equipment like computers escape damage as well. Maintenance: filters should be changed roughly every 3-6 months depending on the pollutants in the air to avoid excess strain on the motors due to heavy particulates loading the filter. Model Excel Z can be is small enough to be placed in a variety of places, high or low in a room. LakeAir's Maxum Z filtering system retains airborne particles like a powerful pollution trap. As dirty air is pulled into the air cleaner from the fan, particles become trapped in the Excel Z filter. This filter is moisture resistant with a high particulate capacity with virtually no change in static pressure. Please note that the filter should be changed when it becomes noticeably dirty approximately every 3-6 months depending on the pollutants in the air as it will damage the motor if it is not changed frequently enough. The carbon after filter removes odors from the purified air which needs to be replaced approximately every 3-4 months to work effectively and efficiently. 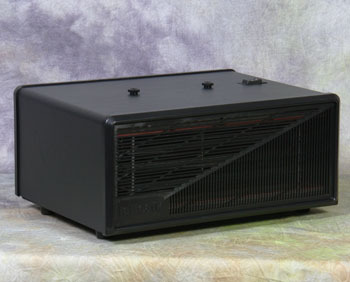 Maxum Z can affordably clean the air in a room 20' x 20' 6 times an hour.The replaceable filter can last up to 6 months. providing the best in air cleaning with contemporary style and versatility. 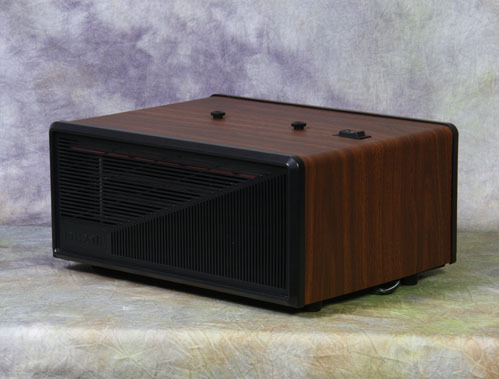 Your will notice the difference as the LakeAir Media air cleaner purifies your indoor air. Maxum Z can be used anywhere you desire clean, fresh air. The Media filter removes up to 90% of airborne particles as small as 4 microns and 98% of particles 6 microns in size and larger. Anyone who suffers from the irritation of dust, pollen or smoke will appreciate the benefits of cleaner air with the LakeAir system, especially those who suffer from asthma or allergies. The LakeAir Maxum Z filtering system traps up to 98% of all airborne particles (even those as small as 5 microns) for a cleaner, healthier environment. The Maxum Z filter removes smoke, bacteria, pollens and dust particles from the air as small as 0.03 microns. The optional activated carbon after filter eliminates stubborn odors. Model Maxum Z can be is small enough to be placed in a variety of places, high or low in a room. LakeAir's Maxum Z filtering system retains airborne particles like a powerful pollution trap. 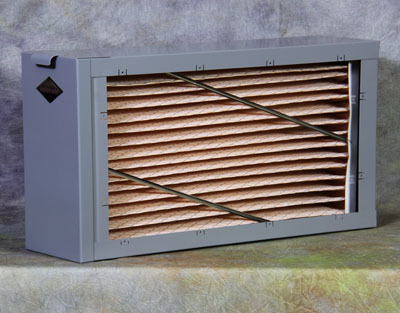 As dirty air is pulled into the air cleaner from the fan, particles become trapped in the Maxum Z filter. This filter is moisture resistant with a high particulate capacity with virtually no change in static pressure. Please note that the filter should be changed when it becomes noticeably dirty approximately every 3-6 months depending on the pollutants in the air as it will damage the motor if it is not changed frequently enough. The carbon after filter removes odors from the purified air which needs to be replaced approximately every 3-4 months to work effectively and efficiently. 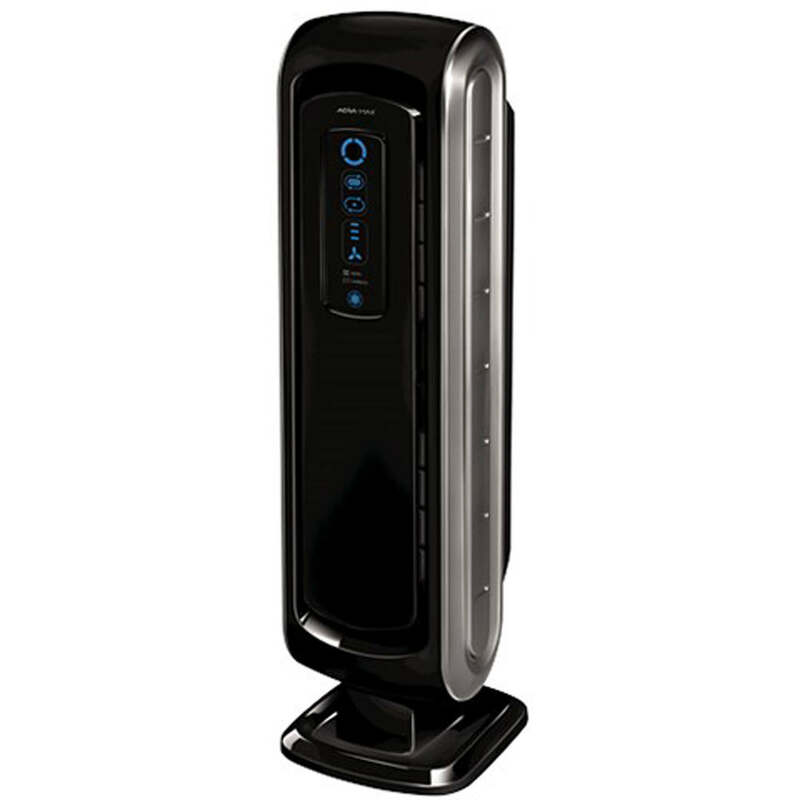 Effectively purifies air in large rooms. AeraSmart� sensor detects the air quality and automatically adjusts the fan speed to keep your air purified. True HEPA filter with AeraSafe� antimicrobial treatment safely removes 99.97% of airborne particles as small as 0.3 microns, including allergens such as ragweed, pollen and mold spores, as well as dust mites, viruses and germs. Extremely effective at removing influenza and cold viruses from indoor air (based on independent testing). Includes Aera+� Mode for cold/flu seasons and features ultra-quiet operation. 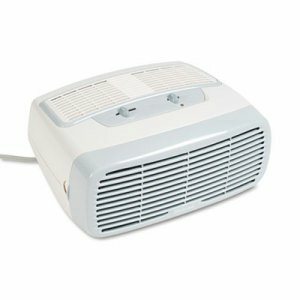 Air Cleaner Machine Type: HEPA/Carbon; CADR: 68 (smoke); 65 (dust); 75 (pollen); Maximum Room Size (Square Footage): 90 sq ft; Maximum Room Size: 9 ft x 9 ft.
Oscillating air cleaner removes up to 99.9% up of all microscopic particles 0.3 microns and smaller from the air. Permanent ifD filter may be easily removed and cleaned, ensuring an extra-long, effective-use life. Odor-absorbing pre-filter helps reduce certain household VOCs and airborne gases. Three air cleaning levels (sleep, standard and max-power) take the guesswork out how to most efficiently clean the air of your home. Tower unit fully circulates the air in a closed room five times an hour, greatly reducing the amount of airborne dust, pollen, pet dander, smoke and allergens. Air Cleaner Machine Type: ifD; CADR: 146 (smoke); 150 (dust); 160 (pollen); Maximum Room Size (Square Footage): 225 sq ft; Maximum Room Size: 15 ft x 15 ft. Compact air cleaner/odor reducer. Four cleaning levels, 2, 4 or 8 hour timer. Oscillation and allergen intelligence setting. Includes 2 prefilters, washable or odor and gas reducing. Freshens air by absorbing odors. Air Cleaner Machine Type: IFD; CADR: 84 (pollen); 95 (dust); 98 (smoke); Maximum Room Size (Square Footage): 150 sq ft; Maximum Room Size: 15 ft x 15 ft. Ensure clear, clean air, with true HEPA filtration that captures 99.97% of pollen, dust, pet dander, mold and smoke down to 0.3 microns. 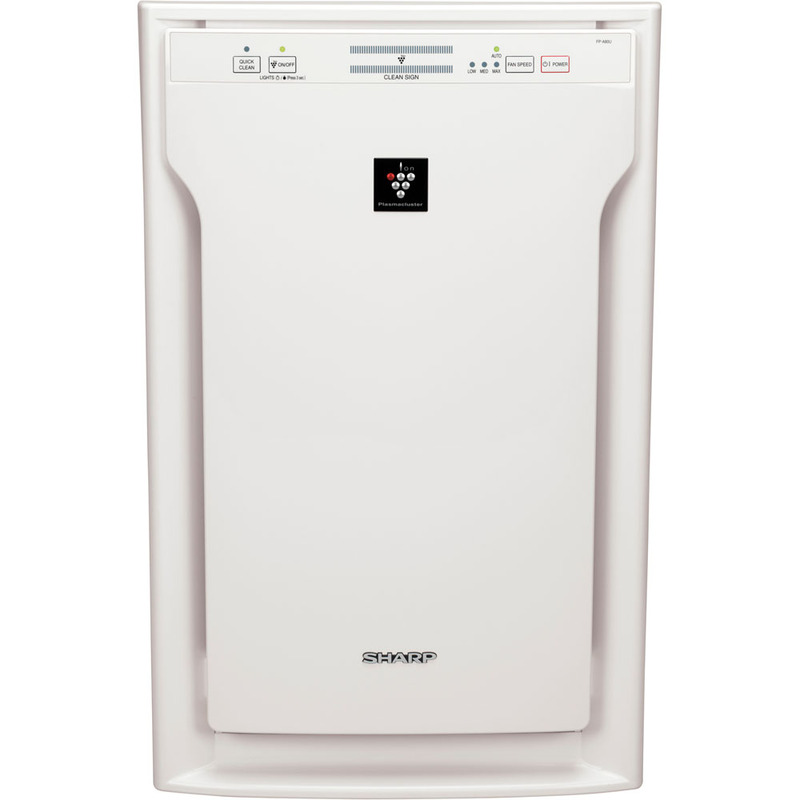 Combining true HEPA filtration and unique and powerful engineering, Allergy Pro� makes it easy and affordable to maintain an allergen-free environment. Allergy Pro� works hard to keep your air clean. 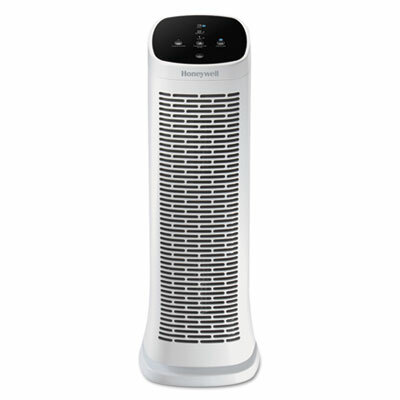 Air purifier with a slim silhouette occupies minimal floor space. Energy efficient. Air Cleaner Machine Type: Ionic; CADR: 150 Pollen; 125 Dust; Smoke 119; Maximum Room Size (Square Footage): 212 sq ft; Maximum Room Size: 12 ft x 16 ft. 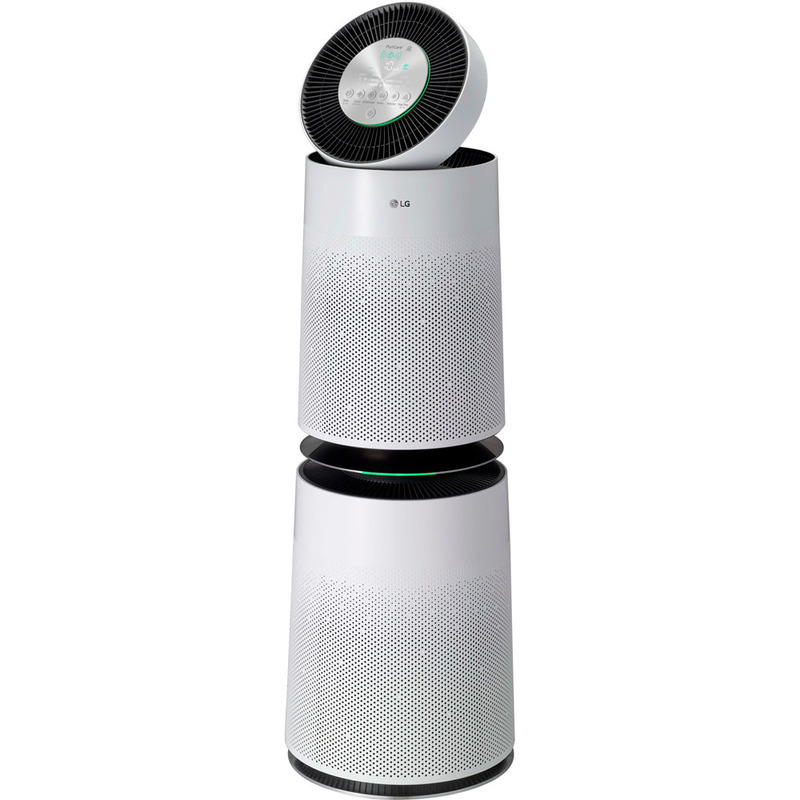 Compact air purifier rids the air of harmful allergens, irritants and particles, while silently circulating purified air back into the room. One-touch operation makes it easy to use. Two settings. Air Cleaner Machine Type: Ionic; CADR: 80 (smoke); Maximum Room Size (Square Footage): 250 sq ft; Maximum Room Size: Small Rooms. Operates quietly to help remove up to 99% of airborne particle such as pollen, dust, mold, pet dander and smoke, providing relief from odor and irritants in the air. Maximum dust removal traps and locks 30% more dust and particles. 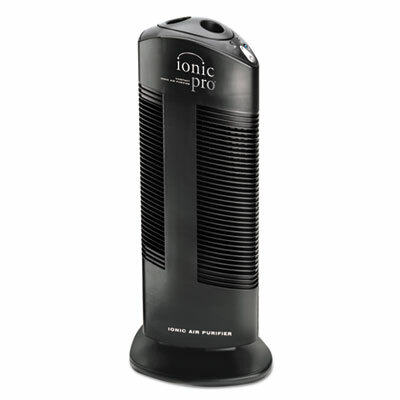 HEPA-type filter captures particles as small as two microns so you can breathe comfortably. Includes one aer1� filter featuring the odor eliminating power of Arm & Hammer� baking soda. Air Cleaner Machine Type: HEPA Type; CADR: 85; Maximum Room Size (Square Footage): 132 sq ft; Filter Types: aer1� Filter. 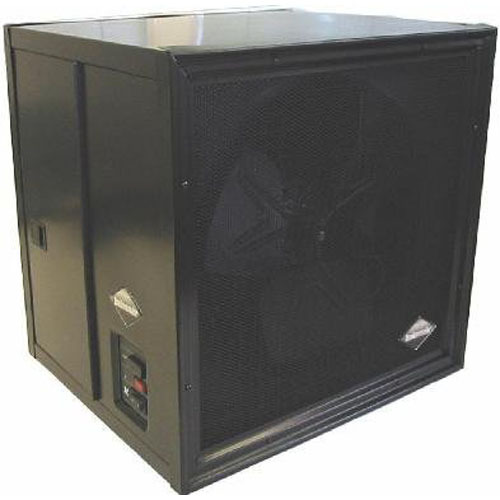 Model LA-2000S commercial and light industrial size model continues the LakeAir™ tradition of providing the best in air cleaning with contemporary style and versatility. Your customers will notice the difference and so will you as the LakeAir electronic air cleaner purifies your indoor air. LakeAir's triple action filtering system works like a pollution magnet, trapping up to 97% of particles as small as one-millionth of one inch for a healthier business or industrial environment. Model LA-2000S can be used in bars, casinos, restaurants, meeting halls, bowling alleys, clubs or anywhere you desire clean, fresh air. The prefilter removes dust, hair, lint and larger dust particles. The electrostatic filter removes particles as small as 0.01 microns in size, such as tobacco smoke, fumes, dusts, mold spores and vapors. 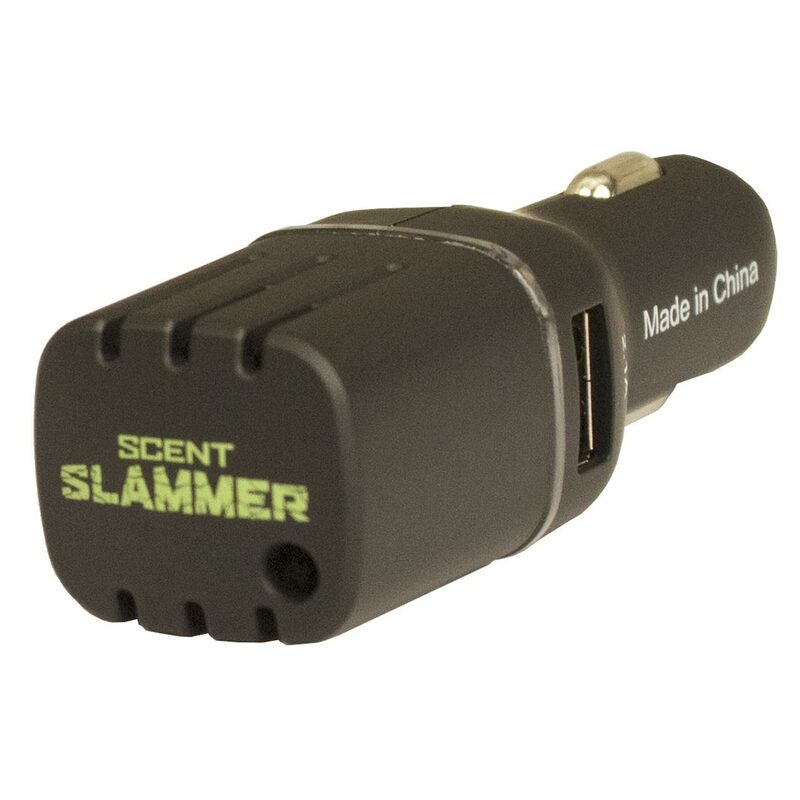 The optional activated charcoal after filter eliminates stubborn odors. *This new electronic cell is lighter weight, making it easier to remove for cleaning and the dual cell design does not require special alignment! The LakeAir™ LA-2000S filtering system traps up to 97% of all airborne particles (even those as small as one-millionth of an inch) for a cleaner, healthier home or office. The LA-2000S filter removes smoke, bacteria, pollens and dust particles from the air as small as 0.01 microns. The optional activated carbon after filter eliminates even stubborn odors. LakeAir units are simple to clean and maintain. Since the electrostatic filter is permanent there are no filters to throw away. It is great for the environment and you will save money because you will never have to replace it! Easy access and its universally recognizable controls make maintenance a breeze. Model LA-2000S can be mounted in a number of ways to suit your preferences and specific application needs to obtain maximum efficiency. Whether you use the eyebolts provided and hang the unit from the ceiling by chains, or use the optional wall mounting bracket (#10009) to anchor your air purifier, you and your customers will welcome the clean air results! The pollutants are detained in this section until washed away during the cleaning process, approximately every 2-3 months depending on the pollutants in the air. The carbon after filter eliminates odors that may have been trapped in the filter and circulates fresh air back into the area. Please note that the carbon after filter should be changed when it becomes noticeably dirty approximately every 3-4 months to work effectively and efficiently. 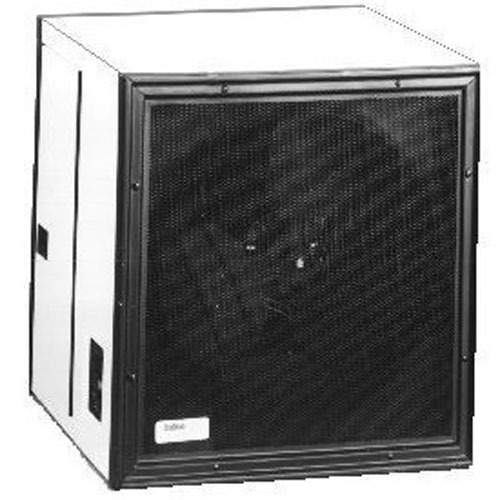 Model LA-1400S commercial and light industrial size model continues the LakeAir™ tradition of providing the best in air cleaning with contemporary style and versatility. Your customers will notice the difference and so will you as the LakeAir electronic air cleaner purifies your indoor air. 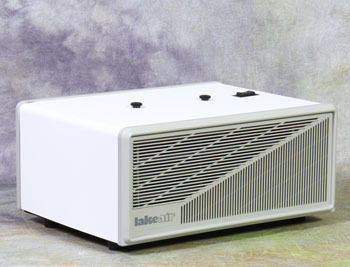 The LakeAir™ LA-1400S filtering system traps up to 97% of all airborne particles (even those as small as one-millionth of an inch) for a cleaner, healthier home or office. The LA-1400S filter removes smoke, bacteria, pollens, and dust particles from the air as small as 0.01 microns. The optional activated carbon after filter eliminates stubborn odors. The LakeAir™ electronic filtering system works like a pollution magnet, trapping up to 97% of all airborne particles (even those as small as one-millionth of an inch)! The electronic filter removes smoke, bacteria, pollens and dust particles from the air as small as 0.01 microns. The optional activated carbon after filter eliminates stubborn odors. 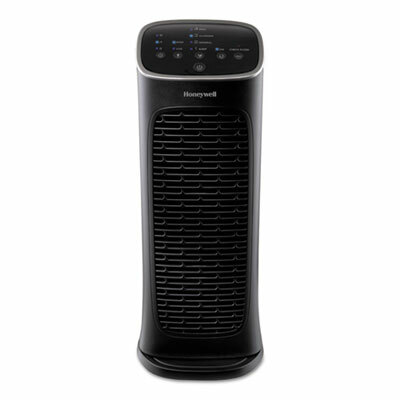 Tower air purifier with HEPA Type filter. Includes Febreze� freshness scent control. Circulates and filters up to five times an hour. Three air cleaning levels. Air Cleaner Machine Type: HEPA Type; CADR: 110 (smoke); 147 (dust); 156 (pollen); Maximum Room Size (Square Footage): 169 sq ft; Maximum Room Size: 13 ft x 13 ft.